With Americans' disapproval of Congress reaching record levels in recent years, the strength of the country's legislative system and America's faith in its outcomes have come into question. This study reveals a new explanation for Americans' dissatisfaction with their elected representatives by showing that people's approval of Congress is tied to their beliefs about how lawmakers are making decisions. 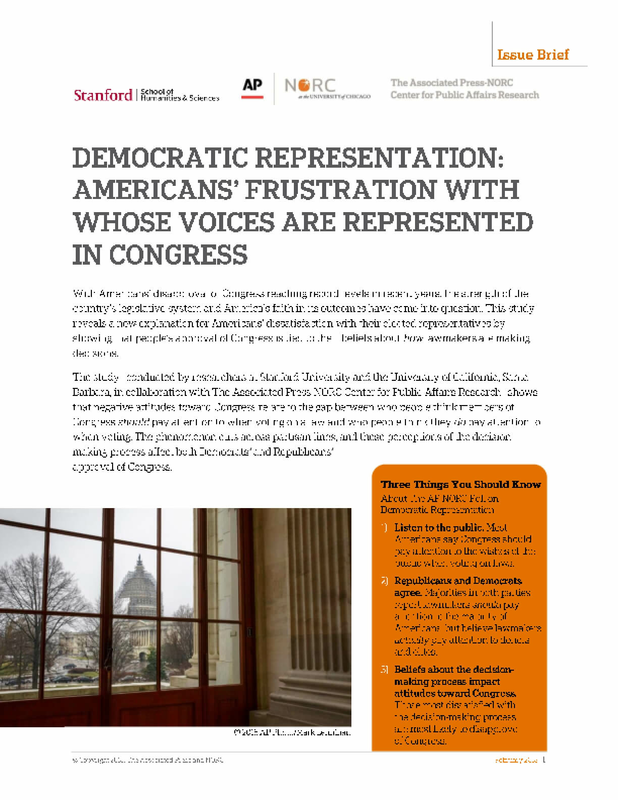 The study—conducted by researchers from Stanford University and the University of California, Santa Barbara, in collaboration with The Associated Press-NORC Center for Public Affairs Research—shows that negative attitudes toward Congress relate to the gap between who people think members of Congress should pay attention to when voting on a law and who people think they do pay attention to when voting. The phenomenon cuts across partisan lines, and these perceptions of the decision-making process affect both Democrats' and Republicans' approval of Congress.